Which Changes Has Cooperative Business School Induced? The evaluation shows that after Cooperative Business School more cooperatives provide services to their members for the core business cocoa, such as joint procurement of inputs and selling of produce. In addition, it found that groups register as cooperatives and increase the number of members. The regional average of groups practicing group procurement ranges from 40 to 64 percent. 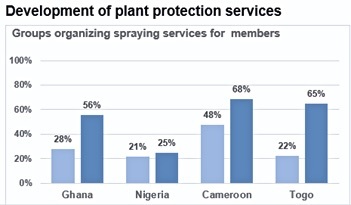 The cocoa inputs most often jointly purchased are fungicides, followed by insecticide and fertilizer. Regarding selling of produce as a group, it is noteworthy that in Nigeria 88 percent of groups and in Cameroon 100 percent of groups negotiated a higher cocoa price. Equally, the uptake of services such as training services and plant protection services improved. Cooperative Business School has shown to have an impact on financial services. While the rate of groups receiving an external loan increased only slightly, there was a significant increase of groups registered who offer internal loans to their members. Besides cocoa production, the survey revealed impacts on food production. 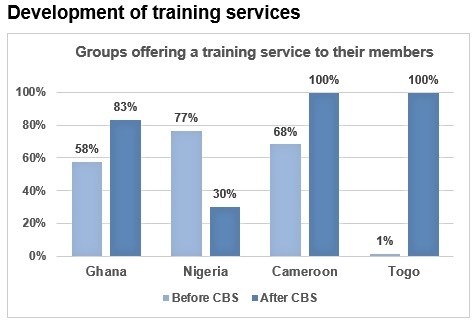 In all countries the percentage of groups jointly selling food products has increased after CBS training. From the surveyed groups, 83% in Nigeria, 91 % in Cameroon, 100% in Togo and 75% in Ghana negotiated better prices. Nevertheless, the shares of groups taking up joint operations on food production are far lower than the ones for cocoa operations. The underlying causes are that domestic food production value chains are usually not as well developed and the specialization of farmer based organisations on cocoa, translates first in changes with regard to cocoa. Therefore, comprehensive strategies to develop specific value chains are needed. The evaluation has revealed that there are big differences between the countries in terms of group dynamics, the functionality of the cooperatives prior to the training and new services offered after Cooperative Business School training. This underlines the need for specific more customized support to farmer based organisations after training that takes the specific environment into account to further improve the uptake of the Cooperative Business School approach. Nevertheless, the evaluation confirms the effectiveness of the Cooperative Business School approach for all services surveyed and is therefore a valuable approach to positively impact the livelihoods of (cocoa) farmers. 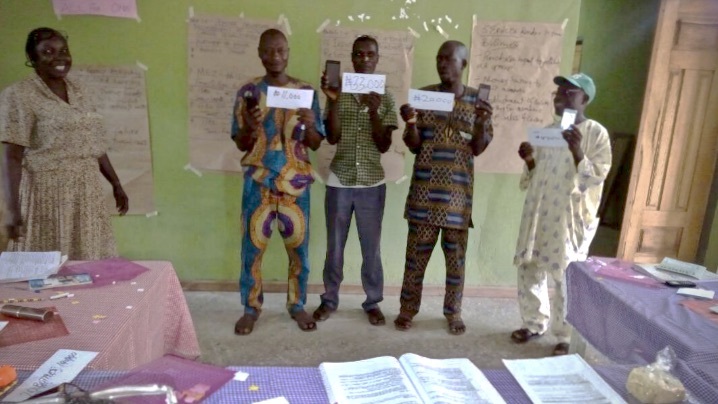 The Cooperative Business School is a training curriculum for farmer based organisations which was developed by the Sustainable Smallholder Agri-Business and Cocoa-Food-Link Programme in West and Central Africa. It builds on the principles and foundations of the Farmer Business School. Participants of Cooperative Business School are managers and members of groups and cooperatives in the cocoa value chain. The training aims to strengthen the service delivery from the group towards its members. Managerial skills as well as transparency, ownership of members and the accountability in the group are enforced.